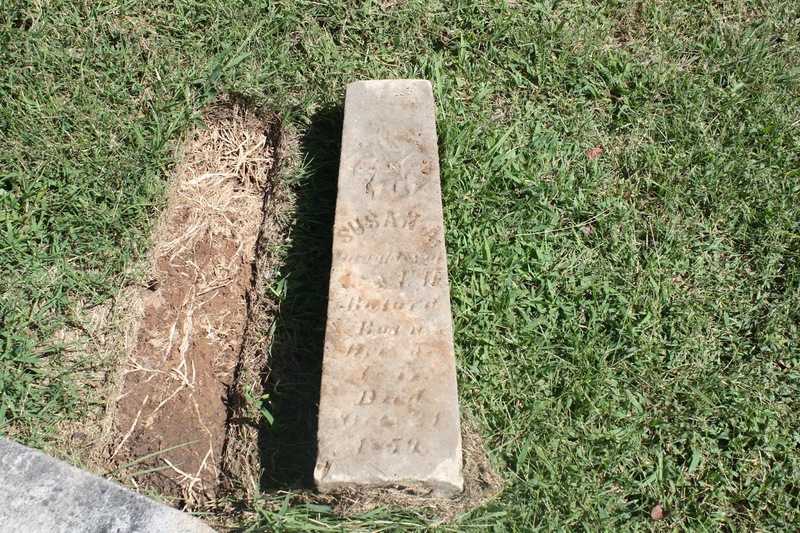 These are the monuments marking the graves of Emily Winifred Townes Buford and two of her daughters, Susan A. and Lizzie T. in Green Hill Cemetery. It wasn’t until I got home and looked at the inscriptions on the stones that I noticed that both Emily and Lizzie died within a month of each other in 1859. Curious as to whether they’d died from childbirth complications, disease, or a tragic accident, I started digging. In 1854, 24-year-old Emily married Algernon Sidney Buford, a University of Virginia-educated Chatham lawyer and House of Delegates Representative. Their first daughter Lizzie was born March 10, 1856, followed by Susan on Dec. 6, 1957 and then Emily on July 4, 1859. 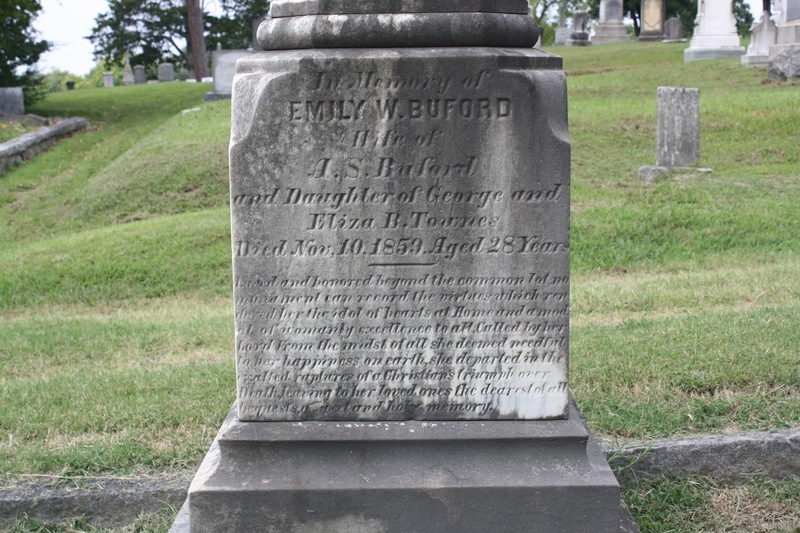 As mentioned earlier, 1859 was the year that Death visited the Buford family. No known burial records for Green Hill exist prior to around 1883, but luckily (for me, not for the Bufords), the 1860 Census Mortality Schedules recorded death information for the previous year. Not only did I discover that Emily and Lizzie both died from diphtheria, but I also discovered that the felled marker in the picture belonged to Susan, who died just nine days after Lizzie from the same disease.When I first visited these graves I didn’t flip the fallen stone, but I returned yesterday to verify Susan’s burial location. Lizzie, who was three years old, was the first to succumb to the disease on October 10. 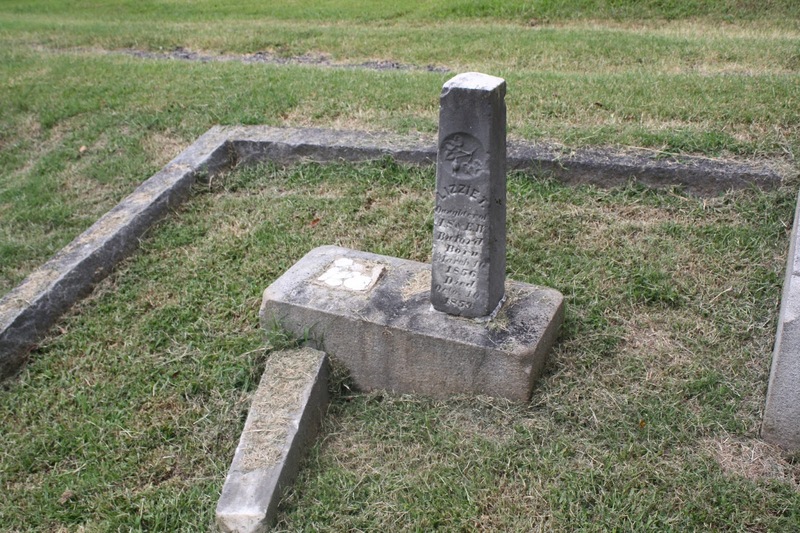 (Her marker lists the 10th, but the Virginia Burial Index has her death date as October 11.) A little over a week later Susan, just a few months shy of her second birthday, joined Lizzie in death on October 20. Emily, most likely deep in mourning over the loss of her daughters, was also afflicted with the contagious disease. She died on November 10 at age 28. Algernon, widowed, was left to raise his youngest child, Emily, who managed to escape the “strangling angel.” During the Civil War the father was in charge of the Virginia Depot in Richmond, indicating that he and Emily left Danville within a few years after his wife and other daughters died. Algernon became President of the Richmond and Danville Railroad in 1865, a position that he would hold for two decades. An unsourced family tree on Ancestry indicated that he may have married for the second time in 1869 to a Kate Wortham, who died in 1874. He definitely married Mary Cameron Ross in 1879. 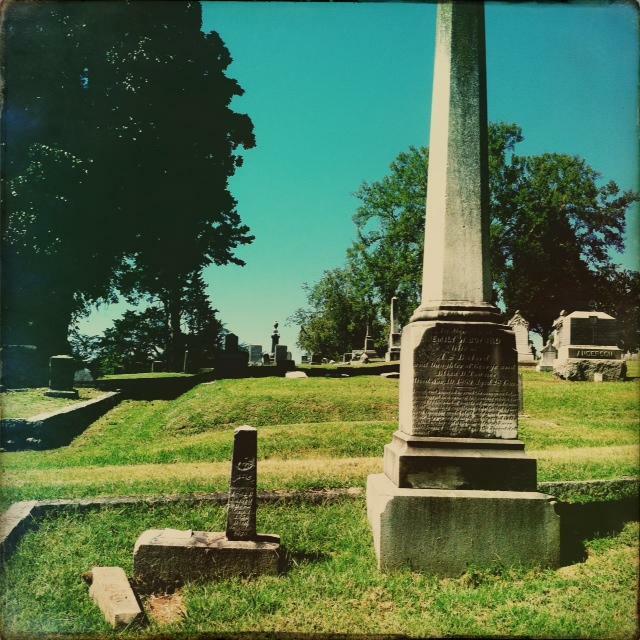 When Algernon died in 1911 he was buried in Richmond’s Hollywood Cemetery. Emily married Col. Clement Manly and lived in North Carolina until her death in 1938 at age 78. Information about contagious diseases in Pittsylvania County for 1859 remains elusive. This site has some details about Pittsylvania County’s diphtheria problem in the 1880s, which isn’t very helpful in terms of statistics for the year the Bufords died but it does list the following as common treatments: gargling with mixtures of sulfur, chlorine, or mercury and wrapping a compress of either salted pork or turpentine-saturated fabric around the neck. I don’t know if any of those treatments were used on Emily, Lizzie, or Susan, but cases like this make me thankful that I live in the more enlightened times of medicine. Previous Previous post: Dr. Reuben Knox: "Accidentally Drowned & Lost in the Bay"